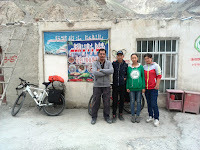 Having undertaken several extreme cycling expeditions in the Northern Areas of Pakistan over the past few years, I and my perennial cycling partner Shahid Dad felt confident of pedalling a portion of the legendary Silk Road inside China’s Xinjiang Uyghur Autonomous Region. We planned to visit the historical oasis towns along the rim of the dreaded Taklamakan Desert, where a wind-blown sand dune can still expose a hidden skeleton of a forlorn explorer, or his camel or two. Starting at Sost in Pakistan, we were to bike across the 15,400 ft high Khunjerab Pass into China, and continue till Hotan to complete our target of 1,000 km. The important way stations to be routed through were Kashgar, Yengisar, Yarkand, Karghilik and Hotan, which, along with Kuqa, were once known as ‘Altishahr’ or six cities that rimmed the sandy Tarim Basin in Xinjiang. The Silk Road, a term coined by the nineteenth century German explorer Ferdinand von Richthofen, is actually a network of several trade routes between China and the West that has existed for over two thousand years. Starting at the ancient Chinese capital of Chang’an (present day Xian), the road bifurcated into two prongs at Anxi to skirt the Taklamakan Desert, and then met again at Kashgar on a further course to the west. Today, high speed expressways cover the same routes, more or less. 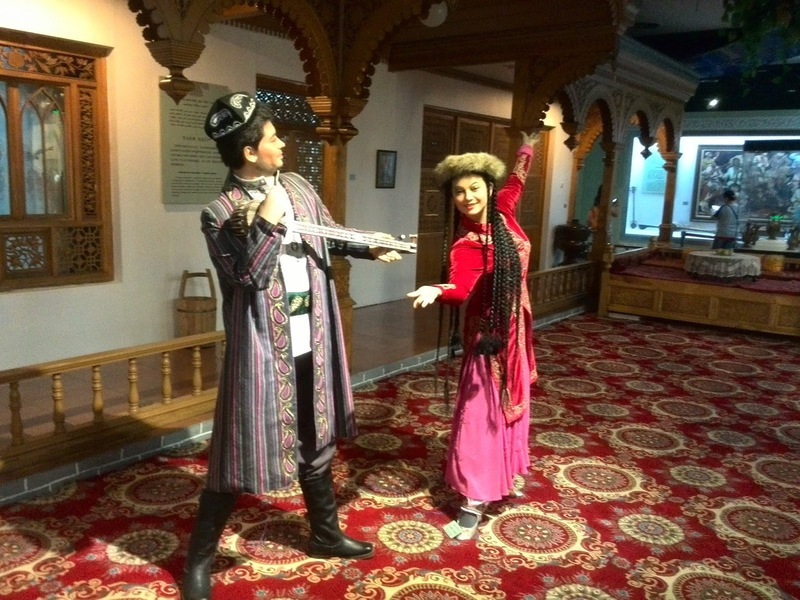 To say that we were excited about journeying in the footsteps of Marco Polo would be an understatement! After staging through Abbottabad, Chilas and Hunza by a pick-up van, we did a test run of our bikes on the new portion of the Karakoram Highway that tunnels through the mountains at five places. The turquoise Ata’abad Lake formed a picture-perfect backdrop during the test ride; happily, we found both man and machine in good working order. After reaching Sost, we checked in at the PTDC motel, where the old faithful Shams-ud-din welcomed us warmly. An excellent handyman, he had been of great help in a previous expedition, and was again at his best this time. 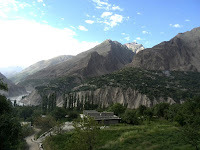 After a two-day stopover which involved tying up loose ends, and some coordination with immigration authorities at Sost, we set course for Khunjerab on 12 July. We had been granted a rare special permission by the Chinese authorities to cross over into China on bicycles, which is otherwise almost always done on an authorised public vehicle, or an escorted private one. The 85 km journey had to be spread over two days, as the very steep climb cannot be negotiated in one go without altitude sickness getting the better of any cyclist. The route to Khunjerab winds through stark mountains, which seemed rather claustrophobic due to their proximity. Callously dumped mineral water bottles and unsightly graffiti spray-painted over rocks – mostly of the ‘X loves Y’ variety – was disconcerting to watch all along the route. Ice cold and oxygen-starved air greeted us at Khunjerab Pass, commonly known as Zero Point. Our baggage arrived in an accompanying pick-up, and it was promptly rigged onto our bikes. In no time we had a mini bedroom, kitchenette, pantry, pharmacy and a workshop each, all mounted on two-wheels. As we crossed the joint Pak-China border post that looked like a huge drive-through mausoleum, a small crowd of visitors cheered us off. 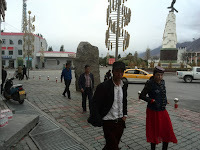 We had to bike another three kilometres before we got to the Chinese security post where preliminary security clearance is done; the detailed immigration and customs formalities are completed at Taxkorgan, 125 km away. The descent from Khunjerab to Taxkorgan was an ear-popping 5,000 ft, though the eyes were treated to beautiful scenery all along, with the Taxkorgan River flowing parallel to the road, and the Kunlun Mountains forming a stunning backdrop towards the east. The lush green pastures were dotted with yurts (tents) of the semi-nomadic Kirgiz, many of whom continue to prefer a pastoral to an urban lifestyle. Arriving at the Immigration and Customs facility in Taxkorgan, we were dismayed to discover that the computer network had developed a major fault. We had to wait for six hours before the system was in order, but during this while we two were given preferential treatment and the VIP waiting rooms were opened for us. 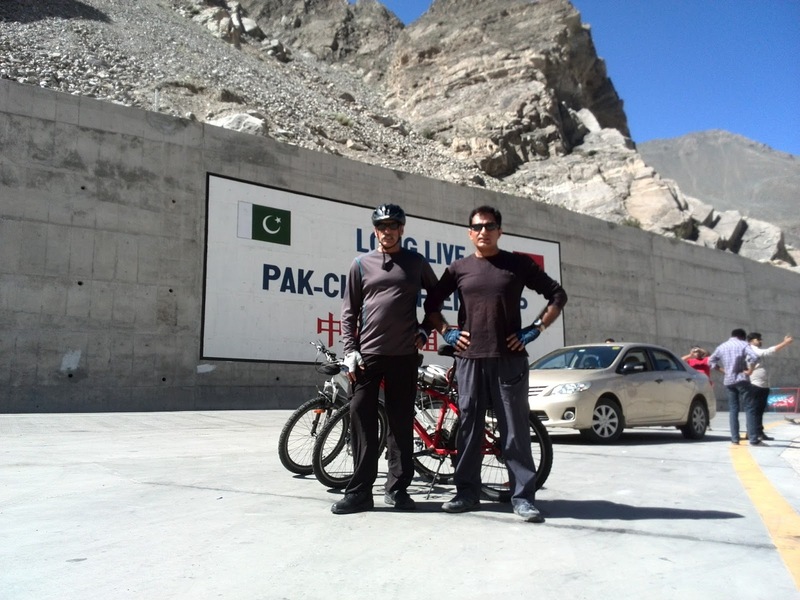 Some officials detailed to give us company told us – in passable English – that according to their records, we were the first Pakistani cyclists to have crossed over from Khunjerab into China. When all formalities were complete, an officer was nice enough to guide us to the Crown Inn, as we speed-biked behind his car in a midnight drizzle. Taxkorgan, the seat of the sparsely populated county of the same name, is the Western-most Chinese town, almost abutting the Tajikistan border. Its population speaks Sarikoli, though the language is officially referred to as Tajik, despite being quite different from what is spoken in Tajikistan. Taxkorgan’s historical links with Pakistan were noticeably advertised through many roadside billboards and buntings celebrating 65 years of Pak-China diplomatic relations. Our salaam greetings were always pleasantly responded to by the surprised locals. The small sleepy town has no high-rise buildings or flashy shopping malls. Some gemstone shops run by Pakistanis from Gilgit and Sost could be seen in the marketplace. Government bureaucracy and Communist Party offices were abundantly evident all over the city. We noticed that mosques were nowhere to be seen, only to discover that the majority people belong to the Ismaili sect who make do with inconspicuous jamaat khanas for religious services. Some cultural affinity with the people of Hunza-Nagar District was evident in women’s headgear, which consists of a colourful pillbox hat held in place by a headscarf. The custom of women shaking hands with male acquaintances was also found to be similar. The small town has little to offer to tourists except the ruins of the 13th century ‘Stone Fortress’, which is what Taxkorgan means. We decided to take a tour of the town on our bikes, starting with a visit to the Stone Fortress. With the museum closed, and finding nothing more than rubble in the so-called fortress, we biked across to the adjacent Golden Grasslands, a soggy pasture with wooden walkways to saunter around. Since it was a working day, none of the amusement facilities, including an open air theatre, were functional. 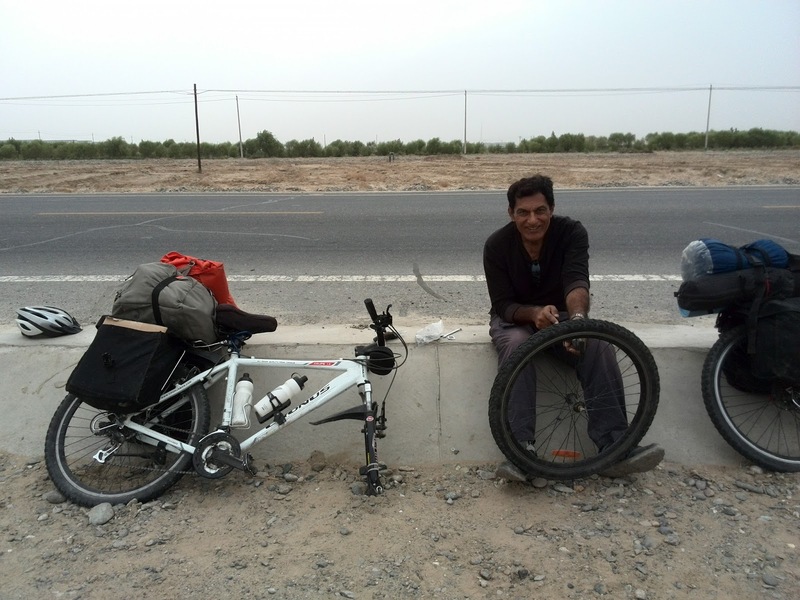 Pretty much done with Taxkorgan, we decided to continue our journey towards Kashgar, the next morning. Soon after leaving Taxkorgan, we were confronted with a very tough ride involving steep climbs, and a monotonous landscape pummelled by a merciless sun. The stillness was occasionally broken by two-humped Bactrian camels grazing over meagre shrub, with distant yurts testifying to their Kirgiz ownership. As we neared Kalasu Dry Port that leads to Tajikistan, we found a gushing stream and promptly decided to camp in its vicinity. Soon after pitching our tents in the shelter of a rocky outcrop, I strolled across and took an invigorating bath in the ice cold stream. Shahid had prepared hot coffee over our petrol-fired stove, which was the right tonic to round off the day. Windy as it was, we struggled to catch a wink, but unfortunately, had a restless night. An oatmeal and coffee breakfast set us up for another day’s very tough ride. Ice cold winds blowing down from the snow-capped Muztagh Ata (‘Father of Mountains’), and an excruciatingly steep gradient had us panting by the afternoon. We were in no mood to go through the tedium of finding a suitable camping spot and setting up camp, after another gruelling day. While we stopped at the Muztagh Ata Viewpoint for a photo session, an enterprising Kirgiz by the Italian-sounding name of Kaperelli, offered to take us as paying guests in one of his yurts. We agreed on condition that the yurt was neat and clean, and that it would be exclusively for us. His son Mahmood led us to the nearby Kirgiz settlement located at the edge of the serene Karakul Lake, with Muztagh Ata looming in the background. The well-carpeted yurt was inspected and found to be perfect for a good night’s rest. Kaperelli’s wife, Bakht Gul was delighted to be the hostess, and hastened to take our order for dinner, while her children arranged for a load of mineral water bottles. Jashilcha and naan were just the right words out of our handy smart phone translator, and in no time Bakht Gul had prepared a delicious vegetable stew served with bread. We joined the family for the meal in an adjacent yurt that doubled as a kitchen and dining room. Small talk over dinner was restricted to hand signals, but we were able to please the Kaperellis for sharing their Muslim faith, and thanked them for the hospitality. Well-fed and well-rested, we were done with the domestic chores at first light, next morning. After clearing the bill, we took leave for yet another day on the road. Starting off from Karakul Lake, the road was one long stretch of rubble as the new highway, a part of the recently announced CPEC, was under construction. After some very strenuous pedalling we stopped at a modest Kirgiz hotel for lunch. Declining a traditional snack of ice-cold and stone hard naans dipped in green tea, I requested a round of the kitchen to which young Muneera and her sister Zaman Gul readily agreed. Spotting some buns, tomatoes and cucumbers, I put my rusty culinary skills to good use as they watched with much amusement. In no time sizzling veggie burgers were ready, which their brother Alauddin served with ‘Abida’, our favourite ice cream soda. 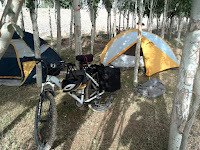 After riding for a challenging 85 km in the mountains, we had difficulty finding a reasonable camping site. To our good fortune, a Kirgiz village (whose name I later learnt was Keluge Ate) appeared in the distance, and we decided to camp there for the night. Knocking at the door of the first house that came our way, we were greeted by children who hurried to call their mother. I promptly rattled out a well-rehearsed Kirgiz line, seeking permission to set up our tents somewhere for the night. Prompted by her excited children, the lady somewhat reluctantly agreed to our request, and pointed to a nearby apricot orchard as the campsite. The sooner we had pitched our tents, with the kids helping us, a man in military uniform appeared and started a discussion with the lady, who had permitted us to camp in the orchard. After a while four Han Chinese – two men and two women – clad in civvies appeared from nowhere, and demanded to see our passports. One of the women could speak good English, and she advised us to move out, as foreigners were not permitted in the village. Our pleading that we had travelled a long distance, and were in no shape to bike any further, had no effect. Finding ourselves in a hopeless situation, we pulled out our ex-military identifications which were closely scrutinised and photographed. Apparently the pictures were sent to some higher headquarters via their smart phones, followed by a phone discussion that lasted for some time. Suddenly, their countenance changed and they were all smiles; we were informed that we could stay on, and that it was ‘just a misunderstanding’. To atone for the fuss caused, they promised all help that we might need during our stay, starting with a supply of mineral water bottles that arrived in minutes! After sleeping well during the night, we had a breakfast of apricots off-the-boughs, downed with coffee; we then broke camp and said goodbye to the hosts. We later learnt that in the past, foreign extremist elements had infiltrated some Muslim villages to subvert the prevailing order, which is why the government had posted Communist Party operatives to keep an eye on the goings-on in various settlements. A good road on a steep downslope tempted us to squeeze two days of cycling in one, so we set course for a long ride. After about two hours of cycling, we were clear of the Kunlun Mountains, and soon caught sight of lush green orchards. The people also started to look different than the Tajiks and Kirgiz we had been seeing so far. 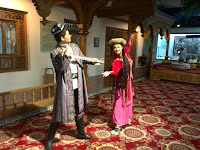 Women wearing colourful headscarves, and men donning the four-cornered ‘doppa’ (toppa or cap) were signs that we were in Uyghur territory, and Kashgar, the hub of the Silk Road trade was not far away. Arriving in Kashgar after pedalling a 115 km long leg, we were exhausted and hungry, but the first thing that we did after checking in at Radisson Hotel was to take a frenzied shower, followed by a much-needed laundry session. Having been camping in the boondocks, the sheer luxury of the hotel acted like a soporific, and the next thing we knew, it was breakfast time the following day! Mamat Tudajim, a young guide turned up on time to take us around the city’s few remaining historical places. Some years ago, the Chinese government had started a modernisation drive, demolishing much of the old city, and with it, centuries of heritage. Of what remains, Mamat chose the Afaq Khawaja (corrupted to Apak Hoja) tomb complex, for a start of the tour. A 17th century religious Sufi leader, the Khawaja was also involved in power struggles and ruled ‘Kashgaria’ some years before his death. His massive tomb includes 72 graves of his relatives, alongside a commoners’ cemetery that is still functional. The complex also includes a mosque with ornately carved wooden pillars and a beautifully painted ceiling of wooden rafters. 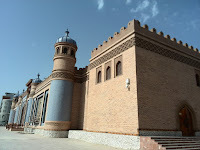 Next to the mosque is a defunct madrassah, an institution that has been officially made to go into disuse in Xinjiang, as it is seen to breed religious extremism. There being no forum for Islamic studies for children, it is left to the parents to impart whatever little they can, at home. A visit to China’s largest Idgah Mosque was instructive in many ways. The entrance portal of the 15th century mosque is a well-preserved imposing structure, while the inside of the mosque is equally impressive. We learnt that all mosques in China are open for only half an hour before and after prayers. Azaan is a low decibel affair, and the Friday khutba by state-appointed imams is strictly state-controlled. An interesting feature of the biannual Id prayers is the distribution of sweets by women, who also sing and dance outside the mosque to welcome their men, after the supplications are over. 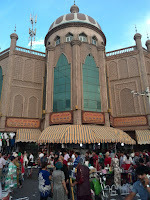 Traditionally, Uyghur women do not enter mosques for prayers, unlike in most Islamic countries. The nearby Grand Bazaar is a covered market for cheap home wares, spices, cosmetics, fabrics and footwear, much like our Anarkali and Bohri Bazaars. Every night the area outside the Grand Bazaar turns into one large open-air food bazaar, where a choice of sesame-studded lamb skewers, laghman noodles, naans, soups, and ice creams are on offer at cheap prices. Irresistibly, we sampled several items that were comically ordered in sign language, much to the amusement of the friendly vendors. 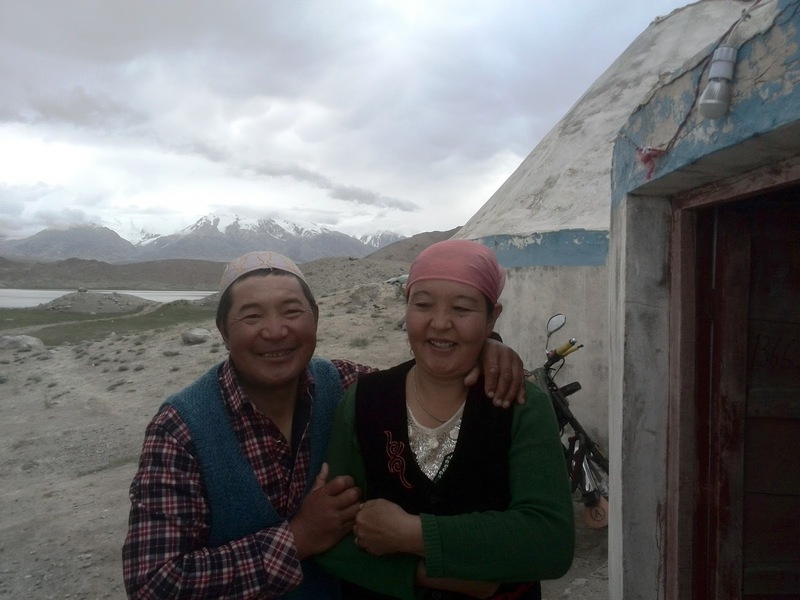 To us, it seemed that Kashgar housewives seldom cook dinners, and families love to eat out regularly. 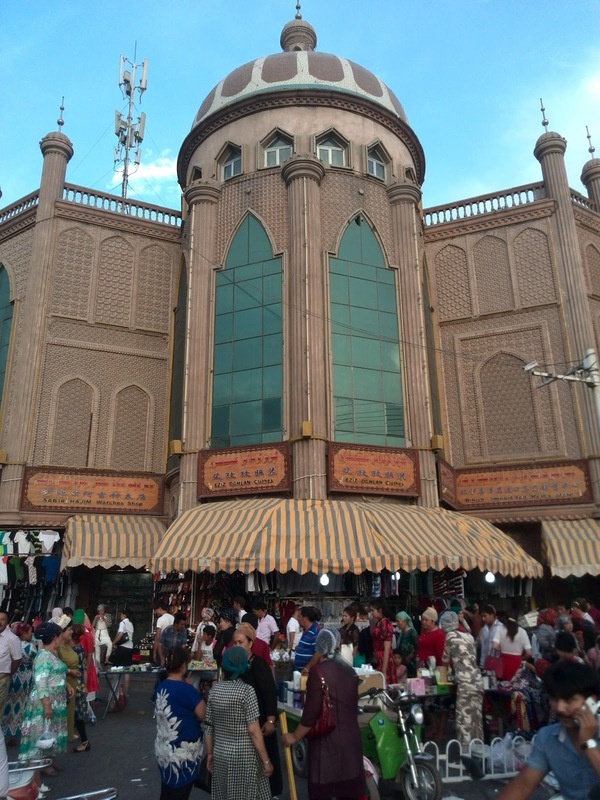 Kashgar’s old town is a crumbling quarter that has a few stubborn residents who are not ready to move out to the steel and glass structures of the modern city. An assortment of antique shops, an odd pottery maker here, a sweetmeats seller there, all hark back to times long gone. The tour of the old town was followed by a hearty lunch at Altun Orda, an upscale restaurant that starkly highlighted how Kashgar has modernised. Next morning I took a short bicycle ride to the city parks. A noteworthy feature of the outing was an admirable street side music performance, in which a trio played the naghra (kettle drums) and sunay (a kind of traditional oboe). 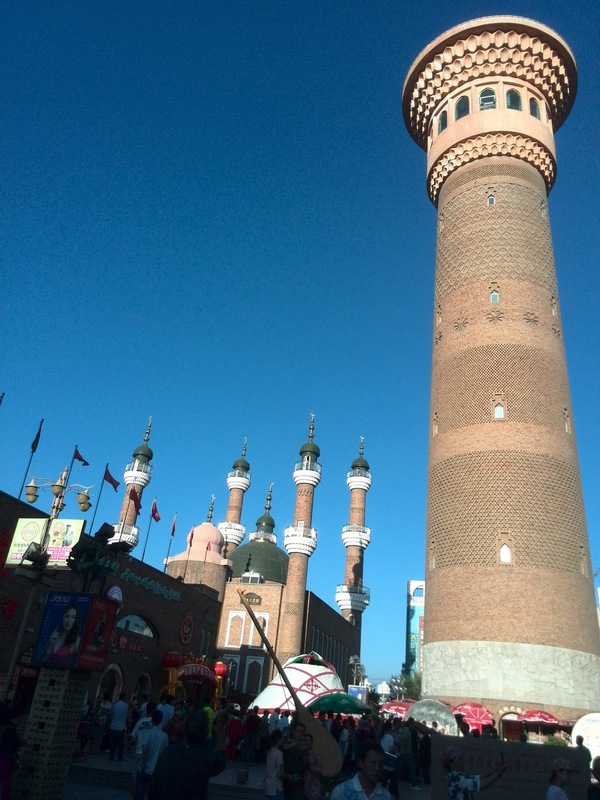 I thought a memory of Kashgar could not be better evoked, than by listening to that bewitching Uyghur music. 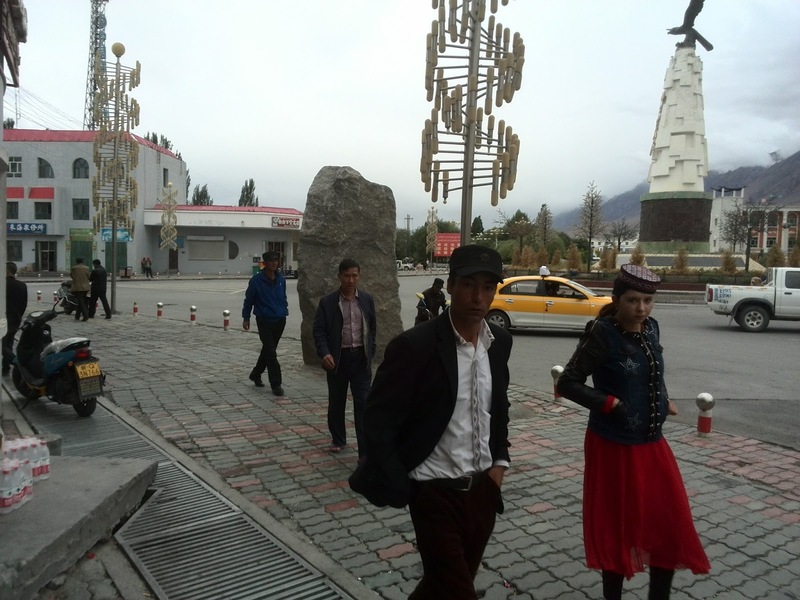 After Kashgar, our next destination was Yengisar, a neat little town famous for manufacturing knives and daggers. Though we had planned to camp for the night, the sight of Oriental Holiday Hotel was too tempting to pass up, so we decided to give ourselves a well-earned break after a hard day on the road. While Shahid amused a group of children who had gathered to see our fancy bikes, I went inside the lobby to check in. As I was going through the process, I heard a wailing siren, followed by a police car halting in front of the hotel, with red and blue flashers lighting up the night. As I joined Shahid to see what had happened, four black-clad armed policemen emerged, and heading towards us, demanded to see our passports. While they were scrutinising the documents, another patrol car screeched to a halt in front of the hotel, with four more menacing policemen joining the earlier ones. After a lot of discussion on walkie-talkies with their superiors, they turned to us, and in broken English, told us to leave the hotel. Unable to converse and find out the reason, we decided to leave, but not before trying the military card. As they all jumbled around to see our ex-military identification papers, we saw their expressions change, and a salute or two followed. Another flurry of calls on the walkie-talkies followed, and to our surprise, yet another police car arrived with some senior functionary, to take stock of the situation. The newcomer was briefed, but he seemed unable to take a decision, while we fretted what the hullabaloo was about. We could not believe when a fourth police car arrived at what seemed like a big crime scene, with scores of curious locals watching from a distance. The latest arrival, apparently the Superintendent of Police, got into a discussion with the hotel manager, without any outcome. By now we were quite fed up, and decided to leave anyway. As we collected ourselves to go, the hotel manager suddenly handed me his cell phone, and told me to speak on. A lady on the other end (probably an interpreter) surprised me in passable English, that the police chief wishes to apologise for the confusion, and that we could stay at the hotel. So after a ten-versus-two bout, we had incredibly won! It was only the next morning that we saw scores of Han Chinese VIPs emerging from the hotel, leaving for some business in police-escorted vehicles. That is when we figured out that their security had been of utmost concern to the police, for Yengisar had been the scene of some vicious knife attacks in the recent past. An evening out in Yengisar’s food street attested to the tight security, as heavily armed police patrolled every warren and alley. After a day of biking in unremarkable scenery, and camping by the roadside poplar plantation for the night, we started early for Yarkand. Drifting sand from Taklamakan Desert blew all the way, but as a welcome tailwind. The Yarkand oasis is spread well over 100 km along the highway, and stretches up to the city of Karghilik. Endless orchards of walnuts, apricots, peaches and water-melons fed by the gushing Yarkand River, could be seen all around. By afternoon we were in Yarkand, but it took us quite a while to locate Super-8 Hotel. Every passer-by or taxi driver that we asked, gestured in the negative. Having biked around much of the city, and quite fed up by then, we inquired from a policewoman who readily pointed at a tall building a mere 100 metres from us. “Suba It”, she replied stridently, almost implying that we had faulty peepers. If only we had got our pronunciation right, we mused! Yarkand city has a distinct, well-laid out modern half on the western side, and a congested, old eastern half. The proportion of Han Chinese in Yarkand appeared more than what we saw in Kashgar, perhaps a quarter of the population. The mutual loathing of Uyghurs and the Han Chinese was obvious, as the former do not seem too happy about the changing demographics. One could feel a palpable tension in the city streets due to heavy police presence. The next day we went down to the Palace Complex and Cemetery of the Yarkand Khans who ruled between 1514-1705. The complex had survived the fury of the Red Guards during the Cultural Revolution, and remains the only worthwhile heritage site of the city. The beautiful blue-and-beige tiled façade of the recently renovated palace was all that could be seen from afar, as the palace is not yet open to the public. The nearby Altun Mosque is badly in need of restoration, though some work was underway on its entrance portal. The tombs of the Khans lie next to the mosque in a serene arboreal setting. Outside the Khan’s cemetery compound lies the tomb of Aman-un-Nisa Khan, the wife of one of the rulers, and a poetess and musician in her own right. Many old Uyghur men and women had gathered at the tombs, in a daily ritual to seek benedictions from the dead Khans who are revered as saints. From Yarkand we set course for Karghilik, where we had planned to camp for the night. After a day-long ride along the orchard-lined highway, we found a plantation next to a stream on the suburbs of the city, which fulfilled all the requirements of a good campsite. After setting up camp, I was gathering the loose articles when suddenly, I picked up the sound of gushing water. Horrified to see a huge flood heading towards our campsite, I shouted to Shahid that we had to act quickly and do something about it. Our tents were just a few feet from being washed away, so the first thought was to quickly shift camp. However, there was no suitable place nearby, and the only option was to somehow divert the flood by breaching an embankment. Without any tools, we frantically started to dig with our bare hands, and in a few minutes had opened up a sizeable opening through which the water started to flow into an adjacent plot. In no time, the pressure of water had widened the breach, and we were much relieved to see it inundating the adjoining plantation, while we were on dry land. We later found out that the spillways of a canal had been opened for irrigation of the roadside poplars, and we just happened to be at the wrong place, at the wrong time. No harm done by the flood, we were able to ride out next morning, only to discover a puncture each, probably after having picked up some thorns at the campsite. Repair was done and we continued with the ride in a blazing sun. The next campsite was in a thicket of bushes strewn with pebbles, as a result of which we had an uncomfortable and restless night. As we were having coffee for breakfast, we both spotted flat tyres, and went through the repair operation that we had become quite adept at, by then. 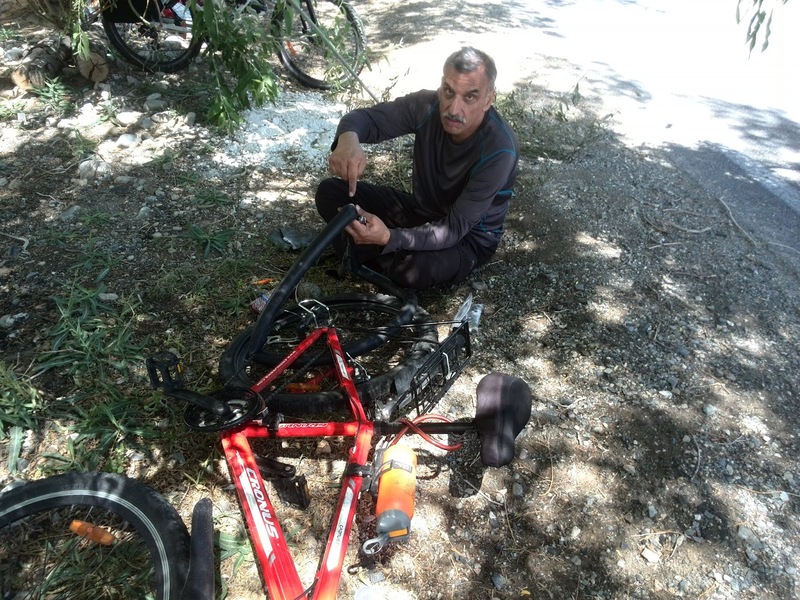 Unfortunately, it turned out to be a very bad start, and by midday, we had had four more punctures. Each repair taking about half an hour, we had been set back by three hours, and there was no way we could reach the next oasis destination by nightfall. Caught in the middle of the Taklamakan Desert, we had to spend the night on the dunes, without dinner. At around 10 o’clock at night, I heard a strange whistling sound followed by a strong gust of wind. Peeping out from my tent, I could see nothing but sand in the air. In a few minutes we found ourselves in the midst of a fierce sandstorm, and the outer flies of our tents flew off like kites. Both Shahid and I ran after the fly sheets like hobbled camels struggling to trot in soft sand. When we finally caught the flies and turned back to fix them on the tents, we were dismayed to find that the tents had collapsed and had rolled off in the dunes. The rest of the night was spent awake, virtually exposed to barrels of sand pouring from the skies. Tired, hungry and grimy, we packed what remained of our tents, and rode off in a huff at first light. 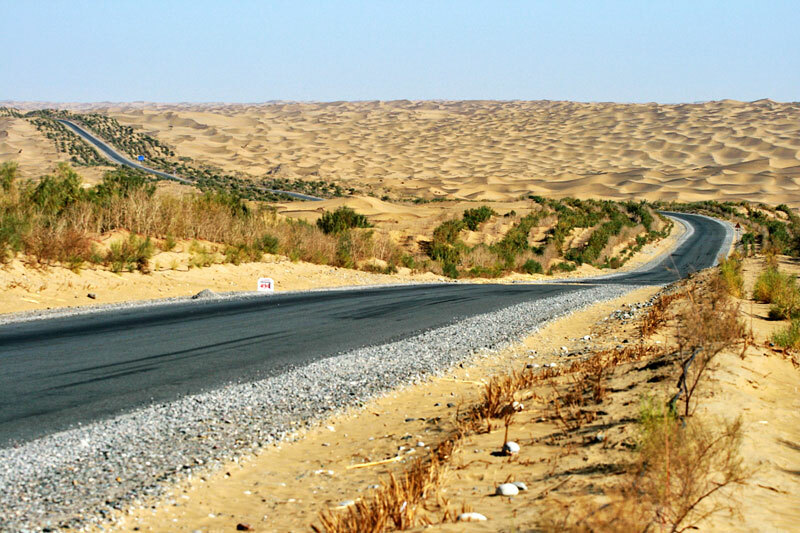 Though two legs remained to get to our final destination of Hotan, Shahid wisely decided that we ought to cover two days’ distance in a single day, if we were to avoid another night on the dunes. Aided by a tailwind but tortured by a fierce sun, we had to brave three more punctures. 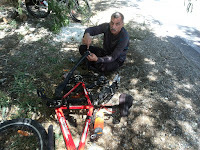 Despite replacement of the inner tubes with spare ones, we had to continually inflate the tyres due to faulty valves. We were luckily spared the ignominy of arriving in Hotan on a rented pick-up, after all the effort that we had put in over the weeks. By the time we pedalled into Hotan (or Khotan), we looked like haggard, emaciated and cruelly sunburnt figures that had arrived with some medieval camel caravan. Twelve hours on the saddle, we had completed the longest leg of 120 km in one day. We had also reached our expedition target of cycling for 1,000 km! 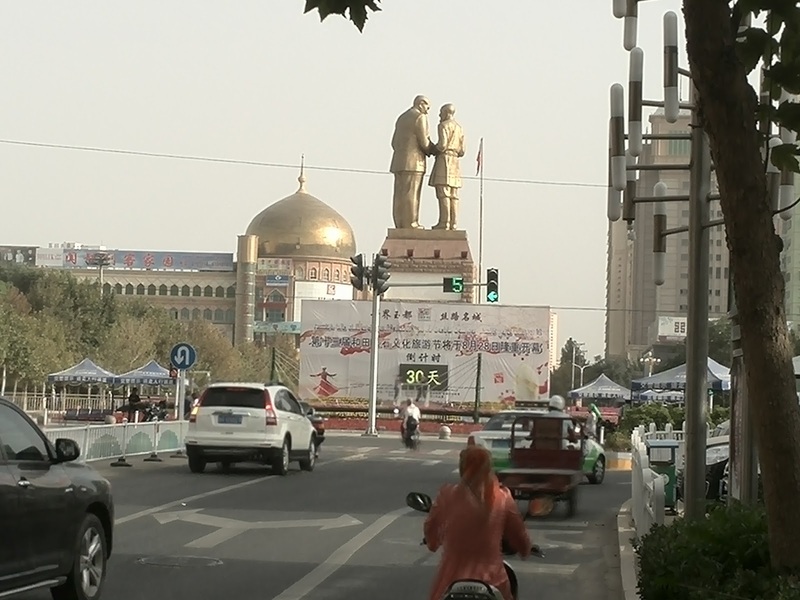 As we entered downtown Hotan, we caught sight of the towering statues of Chairman Mao Zedong meeting a local farmer Qurban Tulum, which mark the entrance to the Unity Square. Qurban’s love for Mao led him to trot across on his donkey, all the way to Beijing, where he was given an audience by the Chairman. Today, Qurban is immortalised for his madcap venture, which is interpreted as an effort at unifying the Uyghurs and the Han Chinese. Next to the Unity Square is a huge golden dome, which at first sight seems like the dome of a mosque. A sign of changing times, it is a temple indeed – not of faith, but that of commerce – the city’s biggest shopping mall. 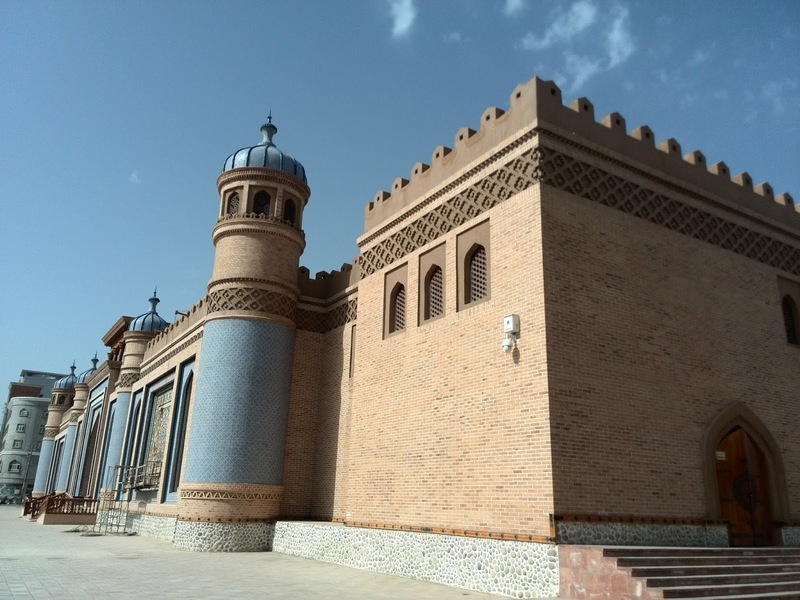 Hotan has changed immensely from a dusty, sleepy town of the sixties that PAF pilots recall, when they first ferried Chinese fighters to Pakistan. Much like Kashgar and Yarkand, it has turned into a city of concrete and glass built over the debris of mud brick villages. The old quarter of Hotan now consists of just a few streets and narrow alleys, where the bulldozers could arrive any time. We wondered if it was the same fabled city of silver-lustered maidens whose tresses wafted fragrant ‘musks of Khotan’ (immortalised in the famous Pakistani song, ‘zulfein teri mushk-e-Khotan, ay jaan-e-mann, jaane-baharaan,’ by Saleem Raza). Qurban Jan, a tour guide at our Yudu Hotel took us for a tour of some traditional crafts, including a mulberry bark paper factory, a water mill, a silk spinning and weaving factory, and a hand-woven carpet factory. These dying arts and crafts are popular with Western tourists, essentially, though we tolerated the tour as a reasonable pastime. In the evening we walked down an old street, sampling sweet water melons from Hotan’s vast fruit orchards fed by the Karakax and White Jade rivers. Later at night, we took a round of Unity Square to watch groups of Han Chinese who regularly congregate for open air ballroom dancing and tai chi, a martial arts discipline that is supposed to increase longevity. We were lucky to find Medina Restaurant run by a Pakistani, and managed to avoid the repetitive fare of laghman noodles that are a common offering at Uyghur eateries. The time had come for winding up our cycling tour, so we disposed off our bikes, gifting one to Qurban and the other to Mamat of Kashgar, who would collect it later. We purchased bus tickets for Kuqa, from where we were to go by train to Urumqi and then leave for Islamabad by air. What remained with us were memories of the wonderful Uyghurs, a genetic bridge between East Asia and West Asia. 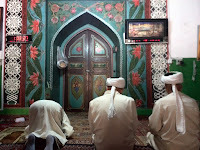 Their colourful dresses contrast with their simple lifestyle, their Turkic Uyghur language vies with Mandarin for a place in the world ethnologue, and their Islamic faith survives in a sea of material culture. Our cycling trip, besides being an extreme physical challenge for two 62-year olds, was also a fruitful study in ethnography and nature, in a beautiful part of China. This article was published in the daily newspaper The News International in two parts on 2 Oct and 9 Oct, 2016.